As you may have noticed on the chopping board, we do like our burgers. I have personally tried to eat a burger every where I can. So, below, is a quick review up of all the burgers I have eaten lately, in no particular order, so that you can have a look at a bit of #burger #foodporn, and get a taste of some more in depth reviews, including the all important scoring, to come in the future. If you have any particular ones you would like to review first, let me know in the comments, Nathan. Beef burger with lettuce, bacon, cheese, tomato, served on a soft glazed roll, I suspect is a bread top bun. 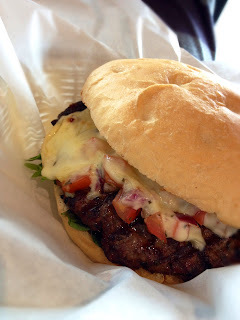 This is my favorite burger in the Adelaide CBD at the moment, the mince is tasty, well seasoned and cooked medium rare. Combo of tomato sauce and mayo was nice. Served with the best onion rings you'll find. Not the cheapest meal at $18, but the onion rings make you forget that quickly. 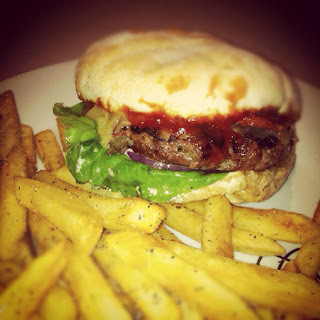 This burger has also been reviewed by Mirko here - Press Burger Review. Beef burger, cooked medium with slaw, tomato, onions, cheese, pickles, mustard and ketchup. Brioche style bun adds a nice sweetness to the burger. Chips are ok, pretty standard. Mine was cooked a little past medium, the patty was still nice, but not as loose formed as some other hand made patty's. Better priced @ $15 than other fancier options, worth the time if you are near by. Beef burger, lettuce tomato cheese. The bun is more focaccia style, larger than most of the CBD burgers, more of a blend of American and Australian pub style. What I love about this burger is its balance, plenty of meat in that patty, its not pretentious and classy, its a burger that is great to just eat without the fanciness. Definitely my fave suburban burger. Moderately priced at $11 for a really well sized meal. Beef Burger, Napolitana this time, mesclun greens, bruschetta, basil aioli and melted mozzarella cheese. Great combo for a burger, I was surprised how nice the basil was. Pattys here are always well done, but aren't dry or chewy, they still have a good level of moisture. The chips are great and so are the shakes. I do love this, but, the 45 min wait, even with a pre order, can really mess with the experience. These are big burgers, choose to have it with fries or a shake, not both! Another moderately priced burger at $13. I have long been a fan of the food truck revolution in Adelaide, like most, infuenced by both the burger and food truck culture of the USA. My best ever experience was shake shack, and for me, burger thoery comes closest to that experience in Adelaide. 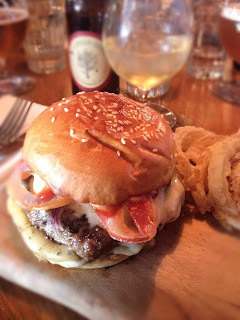 I lined up in Leigh St on opening day for Burger Theory, and have sung their praises ever since. The bun is a soft bread top item, the mince usually well done, I have asked for it to be medium rare a few times, but often it still comes out well done. Chips aren't a winner for me, I don't get them that often any more. Burger is still an experience, the patty is perfectly seasoned, with a great mix of beef cuts that offer a flavour no other burger in Adelaide has matched. Excellently priced at $10, I don't think you can beat it. Cumby Cheese Burger - tomato, pickles, beef patty, jarlsberg cheese, lettuce & tomato sauce. This is a different approach for a pub, choosing to have a gourmet small burger, rather than a meatloaf between two halves of the largest roll they can find. The beef is nice, over cooked but still nicley flavoured. The jarlsberg gives it a nice creaminess, along with some sweetness from again, a bread top bun. A nice option for those who don't want to pay through the nose at closer options, at $10 its good value. Onion rings are an addition at $5, and are worthy. Chips on the side are pretty standard. Combination burger. This is a combination of all their options - Quinoa patty with lettuce, carrot, beetroot, alfalfa, onion jam, sweet potato and cashew spread (vegan friendly) combined with a haloumi burger with grilled mushrooms, lemon thyme. Overall, I was a little disappointed with this combination. The quinoa patty was a little dry and tasteless however the wholemeal bun was fresh and the haloumi and mushroom were delicious. Salads were fresh and added a crisp textural element to the burger. I would definitely go back for the haloumi and mushroom option. A bit over priced at $10 when compared to other options. Cruise'n Burger - Beef, Tomato, Cheese Lettuce, special sauce. Pretty good burger overall, nice tasting patty, well cooked, good charring from the grill. Nice glazed bus, and hand cut, chunky chips were a good touch. The burger is larger than some of the other gourmet options, aligning with what I have found at most suburban burger bars, that these suburban offerings are generally larger and more filling for the same price as CBD offerings. I can't believe no one has mentioned Fancy Burger on Main Road Blackwood just past the NAB on your left as you are going towards the Blackwood circle. George does beautiful burgers and not expensive. You can smell them before you get there. They are the best I have had in Adelaide. Long cues around dinner time so we telephone order and take away. Hi, thanks for the comment. We've actually been to the Fancy Burger at Blackwood and we really liked it. We've got a review of Fancy Burger on the blog, and we're going to be compiling Round up #2 soon, which will include a few places since the original round up was created nearly a year ago. If you have a look down the track at some other reviews it looks like they've reviewed it separately later down the track, but the CBD one rather than Blackwood. Thanks for the comment - we actually have a review on Fancy Burgers by itself in the blog, but just not in a round up. We are currently compiling a 2nd round up. Michael Weldon from Master Chef season 3. Hey - thanks for the comment. We already have Norburger in our drafts, we're just going to visit a few more times to see if anything changes from our first tasting. Agree with Burger Theory and I'll have to try out a couple of the others. I didnt realise Press did burgers too. However like some of the other comments here I can not believe they did not include Fancy Burger (Main Road Blackwood) as they are freaking fantastic. Hi - thanks for the comment. Please keep in mind this 1st round up was done nearly a year ago, so since then we've visited many other burger places and reviewed/posted them individually. We will be compiling our 2nd round up shortly, which will include many of the missing places since this original review was posted. Whoa, what about burger it? 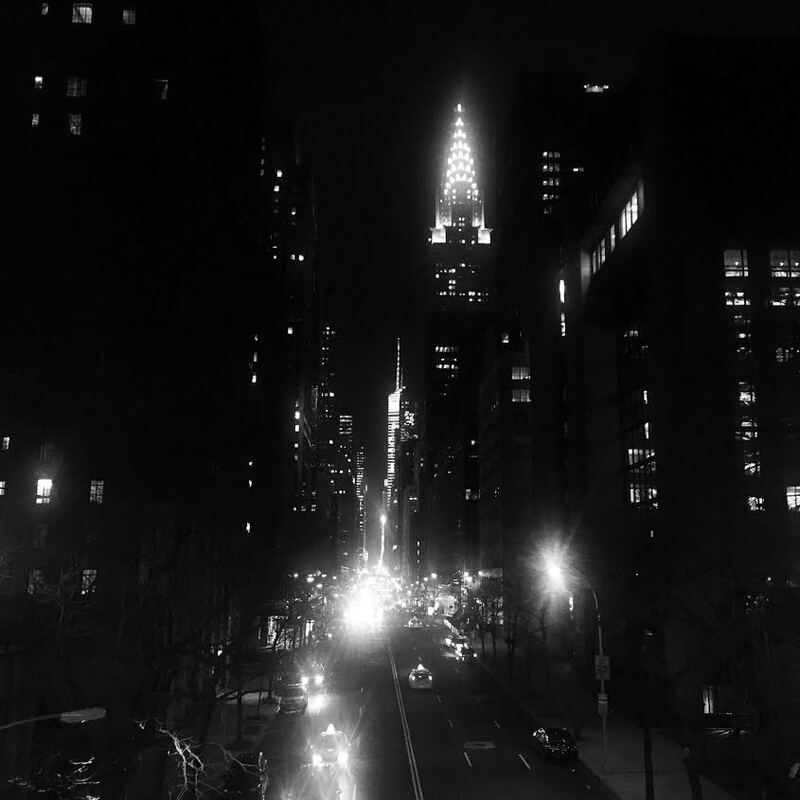 I love that place. It's on O'Connell St, North Adelaide. Burger It? O'Connell St, North Adelaide. I highly recommend the Brie Burger. I just dribbled a little on my phone. 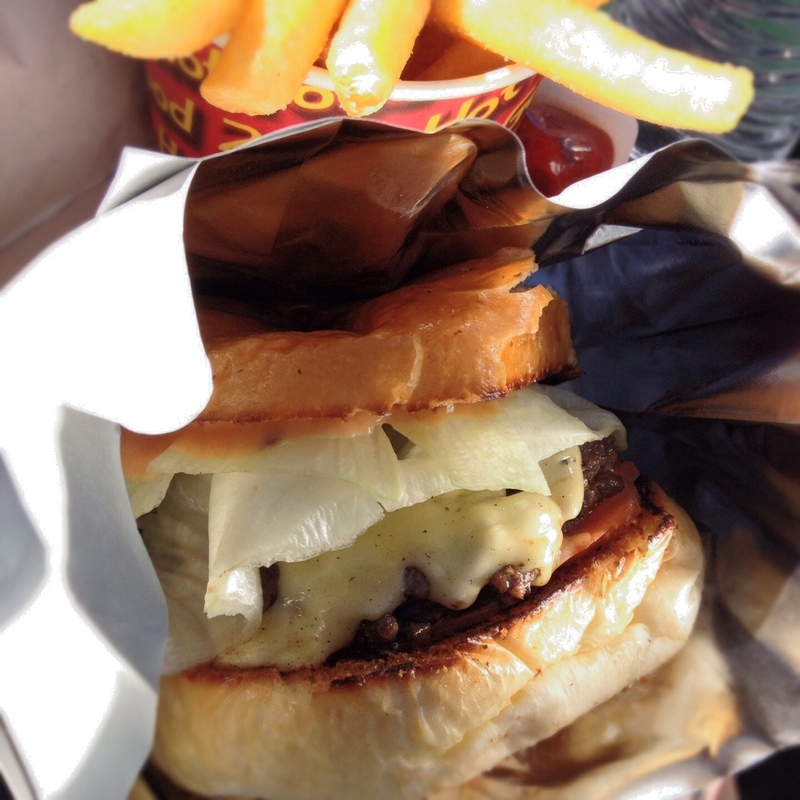 Thanks for the tip, we're compiling our round up #2 so we might include that Brie Burger on our list! Enuf Burger, Anzac Hwy - specifically The Morning After Burger - is a must. Extra hash brown in the side is advised. Thanks for the comment - we'll add it to our list. We're compiling our round up #2 so it might be on there. What about Bad Boy Burger Bar on Melbourne Street, large range and yum yum yum! Agree that Burger It! is quite nice, lots of range also and pretty tasty! Dude what about Burgastronomy at North Adelaide, outshines all of these munters and you can wash it down with a decent beer too. Not one of those crap, sugary buns and has a decent patty that is juicy to the core. The chicken burger (bird or something?) is right up there too. If i was some tosspot wannabe food blogger I'd give them 3 thumbs up! Totally agree re Burgastronomy. The place sells Belgian beer by the bottle and the southern fried chicken and sweet potatoes are incredible there too. blows the competition out of the water. And no mention of Pearl's Diner here either! My favourite so far is from Lucky Lupitas. I always get the Hamburguesa Chipotle Mayonesa with cheese, the chips are awesome as well! Definitely worth the trek down south.